With home prices rising 7 percent year-over-year, renting is often seen as a more affordable alternative to buying. But as ATTOM Data Solutions latest rental affordability report shows, that isn’t necessarily true for a good chunk of the population. 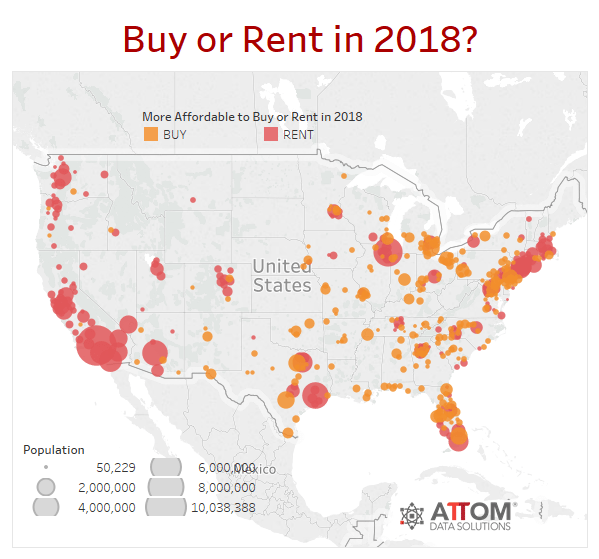 According to ATTOM’s analysis — which includes fair market rent data for 2018 from the U.S. Department of Housing and Urban Development, wage data from the Bureau of Labor Statistics along with public record sales deed information from ATTOM’s database — buying a home is more affordable than renting a three-bedroom property in 240 of 447 U.S. counties (54 percent). “Although buying is still more affordable than renting in the majority of U.S. housing markets, that majority is shrinking as home price appreciation continues to outpace rental growth in most areas,” said ATTOM Data Solutions vice president Daren Blomquist in a press release. Where is it “better” to rent? In the nation’s 14 most populated counties, and in 30 of 39 counties with a population of 1 million or more — including Los Angeles County, California; Cook County (Chicago), Illinois; Harris County (Houston), Texas; Maricopa County (Phoenix), Arizona; and San Diego County, California — it is still more economical, albeit expensive, to rent. On average, renting a three-bedroom property requires an average of 38.8 percent of weekly wages. But in certain counties across California, Virginia, Hawaii and New York, renters are spending upwards of 79.5 percent of their monthly income on rent — well above the affordability threshold of 30 percent. Marin County, California (79.5 percent of average wages to rent); Spotsylvania County (Washington, D.C. area), Virginia (75.5 percent); Honolulu County, Hawaii (71.9 percent); Sonoma County (Santa Rosa area), California (67.6 percent); and Kings County, New York (67.4 percent) were the most unaffordable markets for renters in 2017. Meanwhile, the South and Midwest were home to the most affordable markets where renters spent as little as 22.3 percent of their monthly income on rent: Madison County (Huntsville), Alabama (22.3 percent of average wages to rent); Tazewell County (Peoria), Illinois (23.6 percent); Greene County (Dayton), Ohio (24.1 percent); Sullivan County (Kingsport-Bristol), Tennessee (24.2 percent); and Cuyahoga County (Cleveland), Ohio (24.8 percent). Beyond creating more affordable housing for buyers and renters, industry leaders will have to increase wages to match today’s cost of living — something that is evidenced by the 60 percent of markets (266 out of 447) where rents rise faster than wages, and the 59 percent of markets (263 out of 447) where home prices are rising faster than rents. For this report, ATTOM Data Solutions looked at 50th percentile average rental data for three-bedroom properties in 2018 from the U.S. Department of Housing and Urban Development, along with Q2 2017 average weekly wage data from the Bureau of Labor Statistics (most recent available) and Q4 2017 home price data from ATTOM Data Solutions publicly recorded sales deed data in 540 counties nationwide. Rental affordability is average fair market rent for a three-bedroom property as a percentage of the average monthly wage (based on average weekly wages). Home buying affordability is the monthly house payment for a median-priced home (based on a 3 percent down payment and including mortgage, property tax, homeowner’s insurance and private mortgage insurance) as a percentage of the average monthly wage.